Patti is right. Houseboats these days are sleek, stylish, and an ideal way to take advantage of both land and sea, and now is the perfect time to head for Lake Powell and see for yourself! 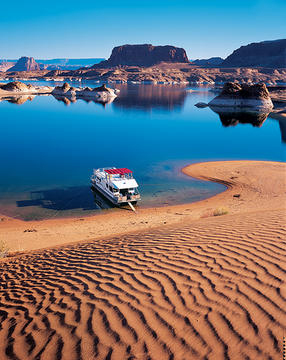 Lake Powell is located in northern Arizona and extends upward to southern Utah. An easy 2-hour drive from the Grand Canyon, it joins the Colorado River in Glen Canyon National Recreation Area. Famous for its many secluded coves and dramatic red rock formations, the water levels at Lake Powell are reaching a 20-year high right now, and previously off-limits areas are now open to boats, allowing visitors to see new sights and explore untouched territory. If that isn’t enough of a reason to go, Lake Powell Resorts and Marinas just announced that you can rent a 46-foot Voyager houseboat for 3 days for only $1195. This is a savings of over $500! They also offer small watercraft rentals, such as jet skis and power boats. Valid for travel Aug. 15 to Oct. 15, this houseboat package can accommodate up to 12 people- perfect for a group of friends or family trip. For more information and to make a reservation, visit Lake Powell Resorts and Marinas, or call 888-669-2704 and request promo code tzhb40.